Accommodation in Harrogate, North Yorkshire. 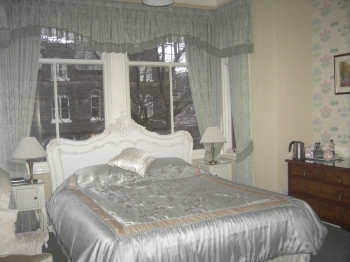 April House is a luxury B&B situated on a quiet, tree-lined street yet only a few minutes walk from the town centre. If attending the Conference and Exhibition Centre, then it is a two minute walk! We have three en-suite doubles, with beds varying from standard to super-king. All have flat screen TVs and tea/coffee making facilities. Free WiFi is provided throughout. A superb breakfast is provided cooked freshly to order. Highly Recommended! Our 7 day weather forecast for Harrogate updated throughout the day, making it ideal for planning leisure activities, travel and events. Read more about our weather forecasts. On Monday 22nd April 2019 the sun will rise at 05:50 and will set at 20:21. It will be a mild day, with temperatures reaching around 20°C. Today is expected to be a dry day, with a very low chance of rain. It will be quite a breezy day, with a maximum expected wind speed of 18mph. On Tuesday 23rd April 2019 the sun will rise at 05:48 and will set at 20:23. It will be a mild day, with temperatures reaching around 16.4°C. Today is expected to be a dry day, with a very low chance of rain. It will be quite a breezy day, with a maximum expected wind speed of 16mph. On Wednesday 24th April 2019 the sun will rise at 05:45 and will set at 20:25. It will be a mild day, with temperatures reaching around 14.8°C. A few showers are expected, 3mm of rainfall is possible today. It will be quite a breezy day, with a maximum expected wind speed of 20mph. On Thursday 25th April 2019 the sun will rise at 05:43 and will set at 20:26. It will be a mild day, with temperatures reaching around 14.1°C. Some moderate to heavy rain is expected, 5mm of rainfall is possible today. It could be quite a gusty day today, with a maximum expected wind speed of 30mph. On Friday 26th April 2019 the sun will rise at 05:41 and will set at 20:28. It will be a mild day, with temperatures reaching around 13.2°C. Today is expected to be a dry day, with a very low chance of rain. It could be quite a gusty day today, with a maximum expected wind speed of 35mph. On Saturday 27th April 2019 the sun will rise at 05:39 and will set at 20:30. It will be a mild day, with temperatures reaching around 10.7°C. A light shower is possible, 2mm of rainfall is possible today. Some quite strong winds are possible today, with a maximum expected wind speed of 50mph. On Sunday 28th April 2019 the sun will rise at 05:37 and will set at 20:32. It will be a mild day, with temperatures reaching around 6.7°C. Today is expected to be a dry day, with a very low chance of rain. It will be quite a breezy day, with a maximum expected wind speed of 16mph. Our weather forecast for Harrogate is updated throughout the day and has been found to be very reliable for planning activities such as days out, leisure, travel, events, fishing, golf and gardening. April House is a luxury B&B situated on a quiet, tree-lined street yet only a few minutes walk from the town centre. If attending the Conference and Exhibition Centre, then it is a two minute walk! We have three en-suite doubles, with beds varying from standard to super-king. All have flat screen TVs and tea/coffee making facilities. Free WiFi is provided throughout. A superb breakfast is provided cooked freshly to order.